A radar beam travels straight and reflects on the surface of an object. The property enables radar to measure the location and the dimension of the object. The Radar Rainfall Gauge system gathers rain signals, omitting the reflection from mountains or structures. Tokyo Amesh has five radar stations, two in Tokyo (Inagi and Minato) and two in adjoining municipalities*, and some 130 ground gauges. Based on the measured data of the devices, the central process unit (CPU) calculates the intensity of the rain. CPU sends the result to the data distribution unit（DDU） and, through it, to terminal stations. At a terminal station, the information is given a graphical interface suited to plant operation. 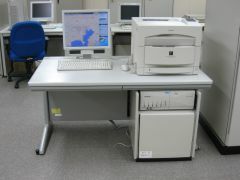 *) Since 2007, Tokyo Amesh has begun to take in the data of adjoining municipalities. The expansion of measuring devices leads to improvement of precision and reliability. Information from meteorological companies is available along with general weather information, such as lightning strikes frequency or typhoon course, on terminal stations. 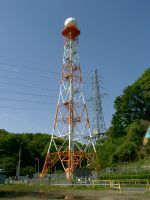 The station observes the area over the Tama cities and sends rainfall intensity data to CPU at an interval of one-minute. 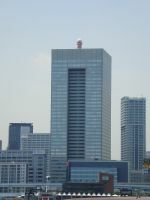 The station observes the area over the Tokyo 23 wards and sends rainfall intensity data to CPU at an interval of one-minute. CPU processes the rainfall intensity data transmitted from radars and ground rain gauges. DDU sends the processed data to terminal stations and outside organizations. 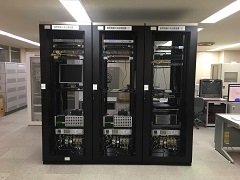 The information of ground rain gauges of Bureau of Sewerage, Bureau of Construction, and the neighboring municipalities are sent to CPU and used to calibrate the information of radar rain gauges. Among the meteorological information, the radar data and the warnings or advisories in Tokyo, is open to the public through Internet Homepage. The update interval is 5 minutes. Terminal Station receives the rainfall intensity data processed in CPU and the general weather information to show them in "easy-to-grasp" graphical interface. Each explanation in detail can be seen by taking the mouse to this button. Copyright © Bureau of Sewerage Tokyo Metropolitan Government. All rights reserved.